Ore from the underground block-cave mine - less than 300mm in size - is conveyed to two stockpiles, each feeding two separate, autogenous wet-grinding circuits. These in turn, each comprise a 9.75 meter-diameter tumbling mill rotated by 2 x 3.5 MW drives. Large rocks impact, scrub and attrition against each other, reducing their size, which results in the liberation of the copper sulphides. Mill products are sized by vibrating screens to produce coarse feed to the pebble crushers. Particles finer than 0.3mm are removed from the circuits as primary milling product at up to 30,000Tpd (tonnes per day?). The coarse cyclone underflow product is also recycled. 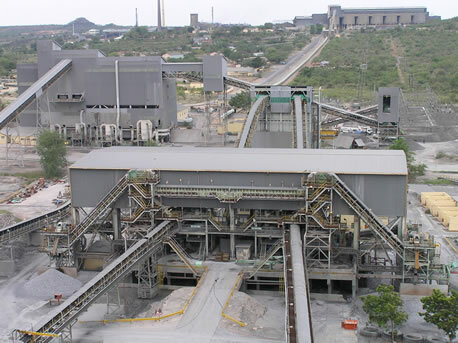 Cyclone overflow from both circuits is then pumped 1.5 kilometres to the secondary milling plant (SMP) where the ore is further ground to less than 0.15mm, using steel balls in up to five parallel 1.2 MW milling circuits. Secondary milling has been applied since 2003 by reconfiguring existing equipment. This is to improve liberation and recovery of copper on higher grade underground ore. Chemicals are added to allow the copper sulphide particles to separate from the fine ore particles through a process of 'froth flotation'. A xanthate collector is metered into the slurry and adsorbs onto to the copper sulphide particles to enhance their hydrophobicity. Frother is also added to generate a stable froth. The stream is then divided between parallel rows of flotation cells. Each row contains several agitators to maintain suspension and to disperse air into the slurry. As the air bubbles rise to the surface of the cells, the hydrophobic copper mineral particles attach preferentially to the bubbles and form a stable froth, which continuously overflows into launders. The process is then repeated twice more to recover almost 90% of the feed copper into only 2% of the feed weight to produce a 32% copper sulphide concentrate. The latter is then pumped to the dewatering plant. Since 2003, two flotation plants have been used to process product from the autogenous mills in series to boost recovery from higher grade underground ore. Slurry that has not arrived at the final froth concentrate forms the feed to the magnetic separation plant. The transition to underground mining has enabled 50,000 tpd of conventional crushing, milling and flotation capacity. Copper and magnetite are recovered on behalf of Foskor (a neighbouring mining company) by toll-processing 20,000 Tpd of marginal ore from stockpiles from the open pit operation. The conventional process route is also applied to underground ore available in excess of autogenous milling capacity. A primary gyratory crusher is used to reduce dump material from up to 1500mm to below 200mm in size before conveying it to either of two stockpiles. Feeders and conveyors transport the ore to a two-stage dry crushing plant where two secondary crushers reduce the size to below 50mm. Additionally, 5 tertiary crushers further reduce the ore to below 20mm, operating in closed circuit with vibrating screens. Crushing plant product is then conveyed 1.4 kilometres to fill any one of six fine ore bins, each one feeding six rod mill flotation sections, all operating in parallel. Certain sections are used for wet grinding marginal ore to below 0.3mm, followed by a copper flotation process similar to that used for the underground ore. Concentrate is pumped to the dewatering plant, while magnetite is removed from the tailings before thickening and pumping final product to Foskor for phosphate flotation. A third secondary crusher-feed stockpile is reserved for 'minus 200mm' underground ore that can be diverted by means of a moveable chute and transfer conveyor. Underground ore is batched through the secondary crushing plant and directed to the fine ore bins. 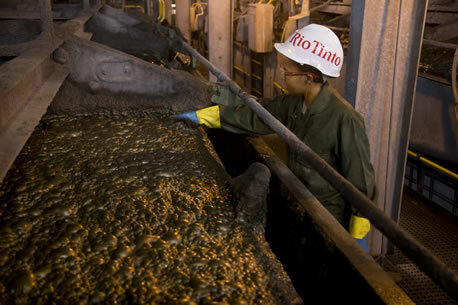 Each section is able to grind 6,000 Tpd of ore finer than 0.2mm before froth flotation. Concentrate slurry is pumped to thickeners using vacuum disc filters and a coal-fired rotary dryer that successively remove water to reach 8% residual moisture. Dryer product is weighed by a belt scale and sampled before it is conveyed to the smelter receiving shed. Flotation tailings from both autogenous and conventional circuits are pumped to the magnetic separation plant, where rotating drum magnets extract 16% by weight of magnetite from the tailings slurry. Nine triple drum magnets are used for three stages of upgrading to produce up to 5000 Tpd of 98% pure magnetite concentrate. The concentrate is separated into two sizes by a rising current of water (elutriation). On average, 600 Tpd of magnetite fines are directed to classifier overflow, which is thickened, filtered and stockpiled prior shipping it to domestic heavy media consumers who use it for upgrading coal. The majority of the magnetite is transported to a classifier underflow and is then pumped either to drying paddocks for railing and export, or to large magnetite storage dams, depending on sales commitments. Export magnetite is used for iron and steel production. After removing magnetite, underground ore tailings flows to three parallel 90 meter-diameter tailings thickeners to recover water and reuse, while the combined underflows are pumped to various points around the perimeter of a large tailings dam. The dam wall is maintained at a higher level by a beach of coarse solids. Fines flow to the central pond, where clear water is decanted by a siphon and stored in a return water dam for reuse in the process.